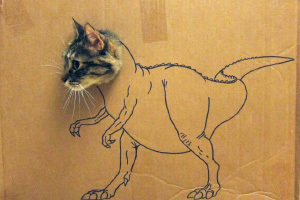 Cats are pretty great when it comes to riding cardboard tanks, however they’re definitely the worst scientists ever. You’d be better off with dog posts. Cats aren’t that interesting or funny. And this is coming from an owner who has both. Go take a photo of your dog while he’s pooping, I know you like that. They remind me of my brother. Every…single…one…of…them.